Hyundai is the leading manufacturer of natural quartz surfaces with the most advanced, nature-friendly manufacturing plant in Korea and North America. Our HanStone® Quartz product lines are ideally suited for reception areas, conference rooms, countertops, vanities, bar tops and other surfaces throughout commercial interiors. We combine natural quartz, one of nature’s hardest materials, with high-quality polymer resin and pigment to produce a durable yet luxurious stone surface. All of these qualities have made HanStone® Quartz a premier choice for builders throughout the world. Our unique Breton™ manufacturing technology allows the combination of outstanding physical and mechanical characteristics with excellent aesthetic appeal. We source various types, sizes and colors of quartz crystals from around the world, which provide the desired hue, feel and design, and capture the spirit and essence of natural colors. Special aesthetics are achieved when the product is made with the addition of materials such as colored glass, mirrors, mother-of-pearl or small pieces of semi-precious stones such as lapis lazuli, and amethyst. An ideal surface for everyday wear and tear, HanStone® Quartz is as practical as it is beautiful. HanStone® Quartz has satisfied the needs of many, it offers architect and designer’s versatility in design with unmatched durability. 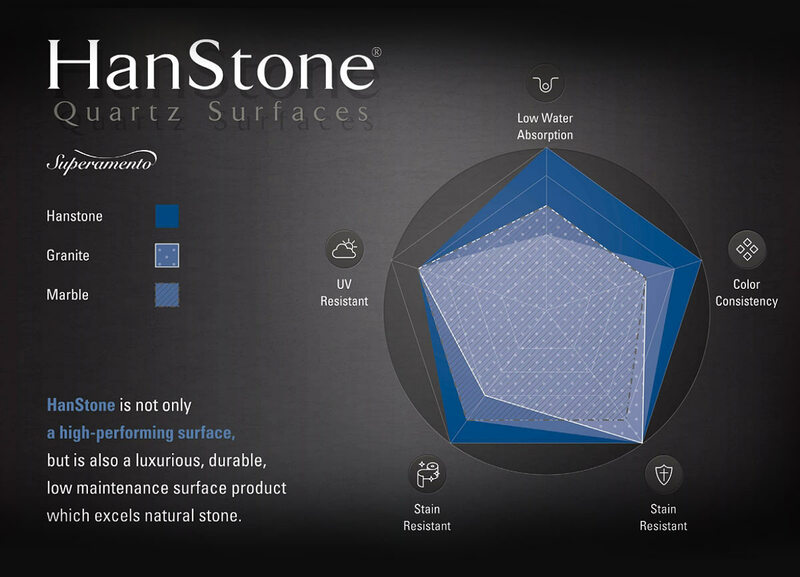 HanStone® Quartz already has been selected by renowned airports, globally recognized exhibition and conference hall, and both residential & commercial use. HanStone® Quartz slabs are manufactured in 20mm and 30mm thickness. Check with your local supplier regarding the thickness of HanStone® Quartz slabs stocked locally. 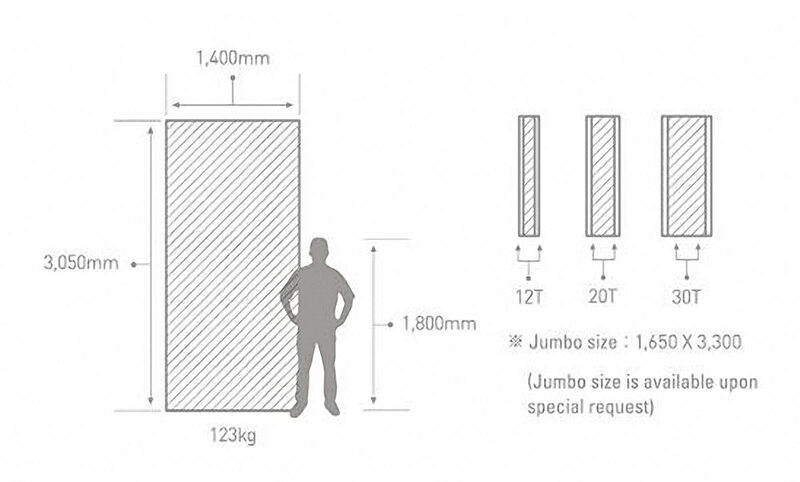 12mm and Jumbo slabs are only available upon the special quantity-order request. * Other custom sizes are available on request. 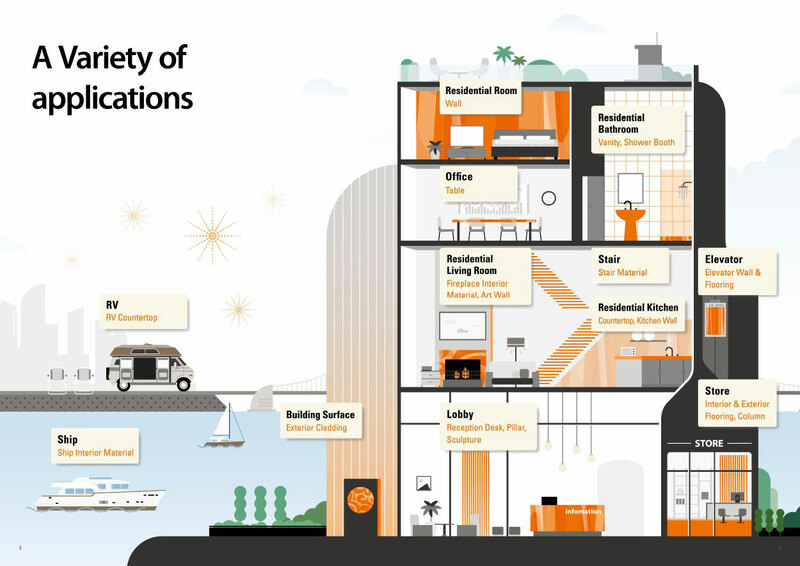 We offer products which support a building project’s effort to achieve certification under the US Green Building Council’s LEED® (Leadership in Energy and Environmental Design) Green Building Rating System™. Our environmentally friendly manufacturing processes and products may also satisfy other requirements for projects that desire to incorporate “green” materials.